Whether you’re planning a small kitchen garden or a large garden to produce most of the food for your family, proper planning will provide a tremendous benefit to the success of your garden and reduce the amount of work and difficulty you face in managing it. How did my garden plot and layout work? Could I change the design to increase its usability? What pests did I have the most trouble with? Make a list of all the seeds you have. You’ll want to use your oldest seeds first. Browse your catalogs for plants that you need or want to try this year. 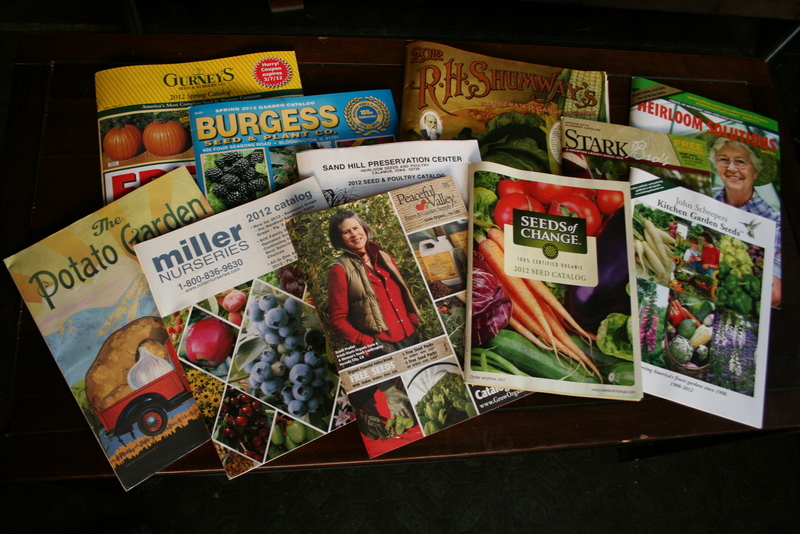 Browse good gardening and seed websites like Seeds for Generations**, GrowOrganic.com and Rareseeds.com for ideas for plant varieties. Don’t be afraid to try new types and varieties of veggies. Consider buying and planting only heirloom varieties – they help preserve biodiversity and generally provide better taste and quality than hybrid varieties. Order your seeds early enough to be able to plant any seeds indoors that need time to grow before transplanting outside. Determine how much of each vegetable you want/need to grow – If you don’t do this essential step, you will end up being one of the many who unfortunately end up drowning in zucchini or don’t have enough lettuce or peppers to satisfy their needs. Calculate how many plants will yield the desired amount of produce. There’s a very helpful produce calculator on PlanGarden.com for this purpose. Decide on your garden layout based upon your unique considerations – there are numerous methodologies, some of which are listed below. Raised bed gardening, where frames are used to contain the soil. This makes weed control and foot access easier, and enables intensive spacing techniques such as those described in the book Square Foot Gardening. Vertical gardening, which uses trellises to train plants to grow vertically, gets more production out of a smaller lateral area. This can be anything from tying up tomato plants on stakes, to training cucumbers on trellis netting, to growing pole beans on an arbor structure, and more. Greenhouse gardening, where a greenhouse or cold frame is used to retain warmth from sunlight and soil for season extension and even year round vegetable production. A combination of any or all of these approaches. Some crops, such as corn and winter squash, lend best to row gardening, while others such as salad crops in a kitchen garden, are well suited for a raised bed setup. An herb garden can utilize permaculture principles well, and having a small greenhouse or set of cold frames for season extension can provide fresh produce into and through the winter. Plot your garden space(s) on paper or with garden planning software, and plan your growing schedule – it is important to both plan the space and plan the timeline in order to optimize your use of available space throughout the growing season. First of all, realize that time is ticking! Determine any plants that need to be started indoors in seedling trays and be sure to get them planted on time, with respect to the amount of time they need before being transplanted outside and where on the calendar this should happen. Your seed packets should have info on the number of weeks before or after your last average spring frost date that indoor starts should be transplanted. Get frost data for your state from NOAA, or on a map here or here. Measure your available garden area, taking into consideration room for paths (for both walking and carts), hoses for watering, and orientation to the sun. Note any areas that get shade and during what parts of the day. You can use Google Earth to see the orientation of the sun at various times of the year overlaid on satellite imagery of your property. 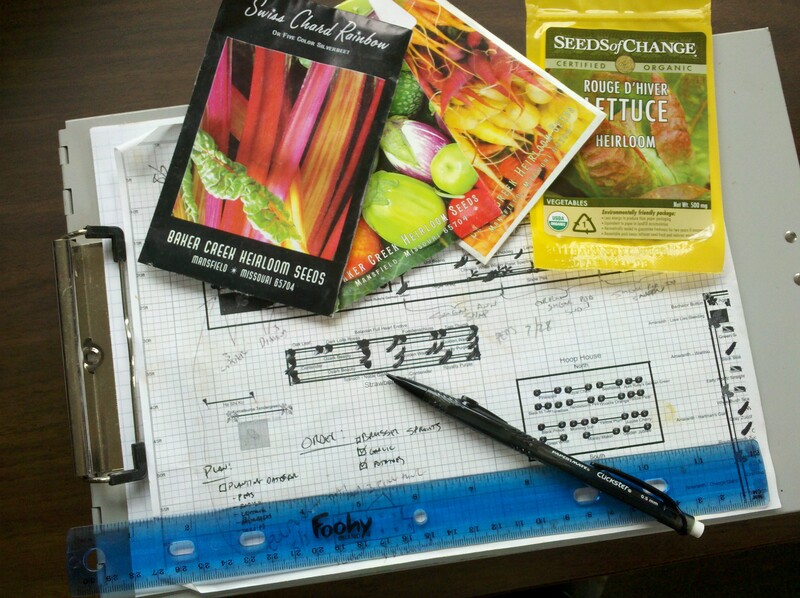 If you like hands-on planning, use grid paper to draw out your garden space, using the dimensions you measured. If you like using technology, try out garden planning software tools like PlanGarden (that I have used successfully for several years), GrowVeg.com or SmartGardener. * You may want to actually use grid paper for sketching the area while you’re outside looking at it and able to take measurements, as it helps you get more accurate dimensions that can then be transferred into software. Realize that you don’t need to plant all of your plants at the same time and that you can double up on some planting areas by planning successive plantings of short season crops in the same space that early harvest crops after they are pulled out. You can also follow early summer harvest crops with fall crops that need to be planted in the summer. Consider companion planting techniques, especially the guidelines that tell you what plants do not like to be planted near each other. I’ve found Carrots Love Tomatoes is a great primer on this subject, and you can download this handy companion planting matrix. We’ll discuss implications of these planning steps in future parts of this series on garden planning and management. Please ask questions and share your experience in the blog comments so everyone can learn, and participate in the True Food Solutions gardening group by asking questions and sharing your insights with other gardeners. * Seeds for Generations is one of my family businesses, started to give my children an opportunity to work together and learn valuable business skills while sharing our love for gardening. I prefer raised bed gardening. Every year I ammend the beds with new composted material. It requires thinking ahead, a year ahead, but it is worth it. The quality of my soil is constantly being improved, and nothing goes to waste: grass clippings, leaves, wood chips, animal manures, vegetable peelings. I have already started on the compost I will use for my garden next year!